The towers of the Arthur Ravener Jr. Bridge, a cable-stayed bridge over the Cooper River, connecting downtown Charleston to Mount Pleasant. 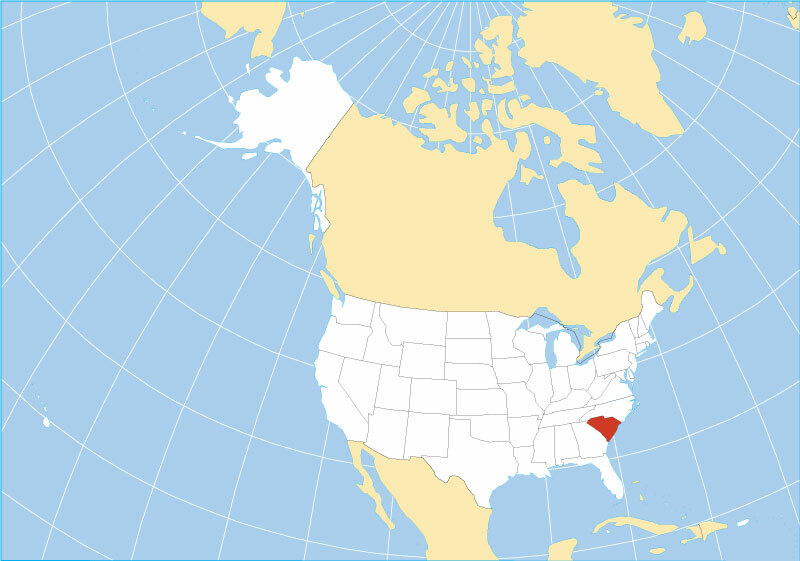 Where in the United States is South Carolina? Location map of South Carolina in the US. South Carolina is a state in the southeastern United States, it is bordered to the north and north east by North Carolina. The Savannah River forms a natural border with Georgia in the west, and the Atlantic Ocean in south east. The states nickname is "The Palmetto State". The region of what is today South Carolina was permanently settled by the English since 1663. Both North Carolina and South Carolina were included in the charter that established Carolina in 1663. South Carolina was separated from North Carolina in 1729. 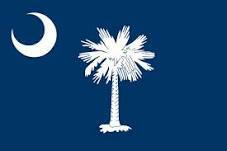 South Carolina joined the Union on 23rd May 1788 as the 8th state, it was one of the original 13 founding states. In 1860, it was the first state to secede from the Union, precipitating the American Civil War. It was readmitted to the United States on 25 June 1868. Today South Carolina is subdivided into 46 counties. The state occupies an area of 82,931 km² (32,020 sq mi) , compared it is about the size of Austria (83,871 km²). Compared with other US states, South Carolina is almost 4 times as big as New Jersey, but would fit into Texas more than eight times. View of the Blue Ridge Mountains from Sassafras Mountain in Pickens County. The narrow Coastal Zone along the seashore includes the barrier islands, natural harbors inside bays, lagoons, and inlets, the beach, and the river deltas, it is part of South Carolina's portion of the Atlantic Coastal Plain. 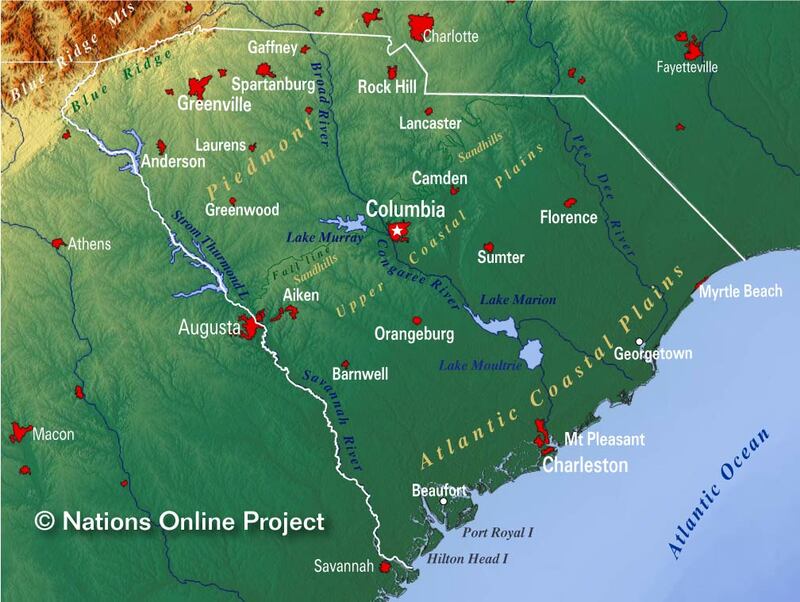 SC's Atlantic Coastal Plain can be divided into the Outer Coastal Plain (or Lower Coastal Plain), with swamps along the rivers (some swamps have been drained to gain farmland); and the gradually rising, fertile Inner Coastal Plains (or Upper Coastal Plain), within that region are the Sandhills, sandy hills and dunes, remnants of the ancient coastline. The 'fall line' escarpment demarcates the border between the lowland of the coastal plains and the upland Piedmont plateau, it is the site where rivers and streams drop off the Piedmont onto the Coastal Plain. The hilly Piedmont region are the foothills of the remnants of an ancient, eroded mountain chain, the Appalachian Mountains. The state's mountain region in north west represents a small portion of the Blue Ridge Mountains, a range in the much larger Appalachian Mountain Chain. Highest elevation in the state is Sassafras Mountain at 1,085 m (3,560 ft), located near the South Carolina - North Carolina border. 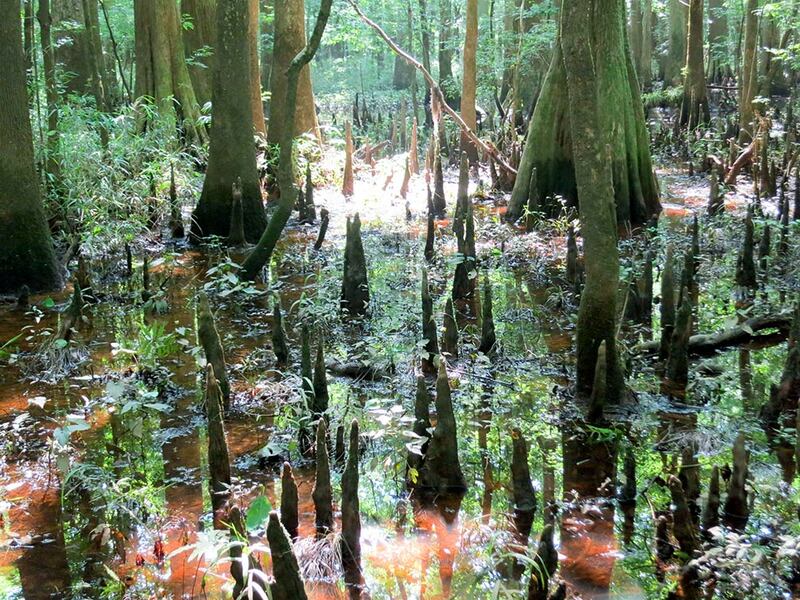 Knees of bald cypress trees in Congaree National Park. The park preserves the largest intact expanse of old growth bottomland hardwood forest left in the southeastern United States. Major rivers in South Carolina are the Savannah River, which forms a natural border with Georgia in the west, its tributaries, the Tugaloo River and the Chattooga River, form the northernmost part of the border. The (Great) Pee Dee is a free-flowing major river in the east of the state, used for recreation and as a source for water supply. The Catawba River is a dammed river that feeds the man-made Lake Wylie (formerly Catawba Lake), the river is also the source for the man-made Lake Wateree, the lakes primary outflow changes the river's name to Wateree River, which becomes a tributary of the Santee River. The Santee and its tributaries, the Broad River, the Wateree and Congaree rivers drain large areas of central South Carolina. The Saluda River is a principal tributary of the Congaree River. The 354 km (220 mi) long Edisto River is one of the longest free flowing blackwater rivers in the United States. The 243 km (151mi) long Black River is another blackwater river in South Carolina. Within the state there are several major lakes, the largest being Lake Marion, Lake Strom Thurmond, and Lake Moultrie. 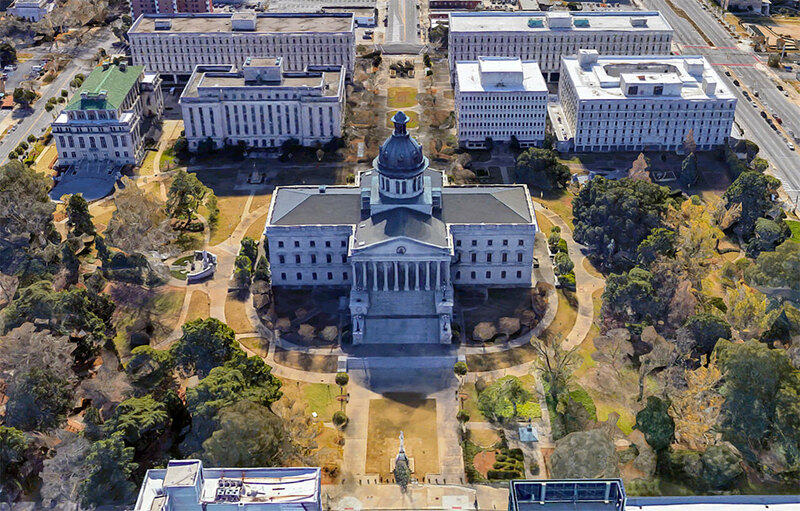 Rendered image of the South Carolina State House in Columbia. The Greek Revival style building houses the government of the U.S. state of South Carolina. South Carolina has a population of 5 million people (2018 est.) ; capital and largest city is Columbia. Other major cities are Charleston and North Charleston, Mount Pleasant and Rock Hill. Busiest airports in the state are Charleston International Airport (IATA code: CHS), and Greenville-Spartanburg International Airport (IATA code: GSP). 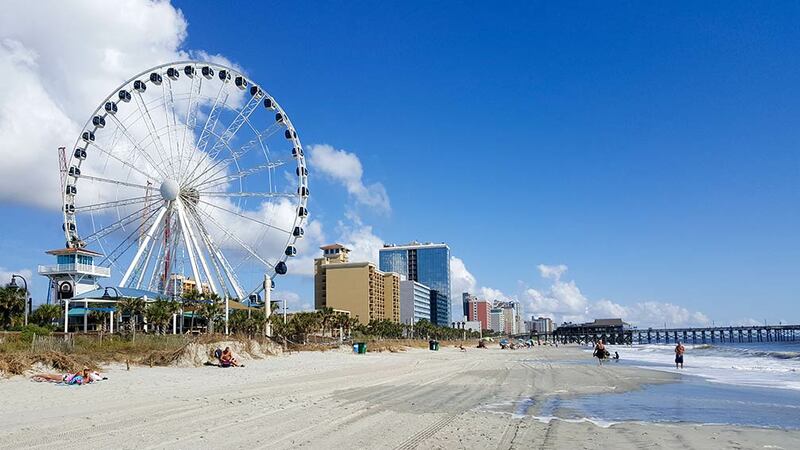 The Ferris wheel at Myrtle Beach, the holiday resort in Horry County on South Carolina’s Atlantic coast. Abbeville, Aiken, Allendale, Anderson, Bamberg, Beaufort, Belton, Bennettsville, Camden, Cheraw, Chester, Clemson, Clinton, Conway, Darlington, Easley, Florence, Gaffney, Georgetown, Goose Creek, Greenwood, Greer, Hartsville, Kingstree, Lake City, Lancaster, Laurens, Marion, Mullins, Myrtle Beach, Newberry, Orangeburg, Spartanburg, St Andrews, Union, and Walterboro. 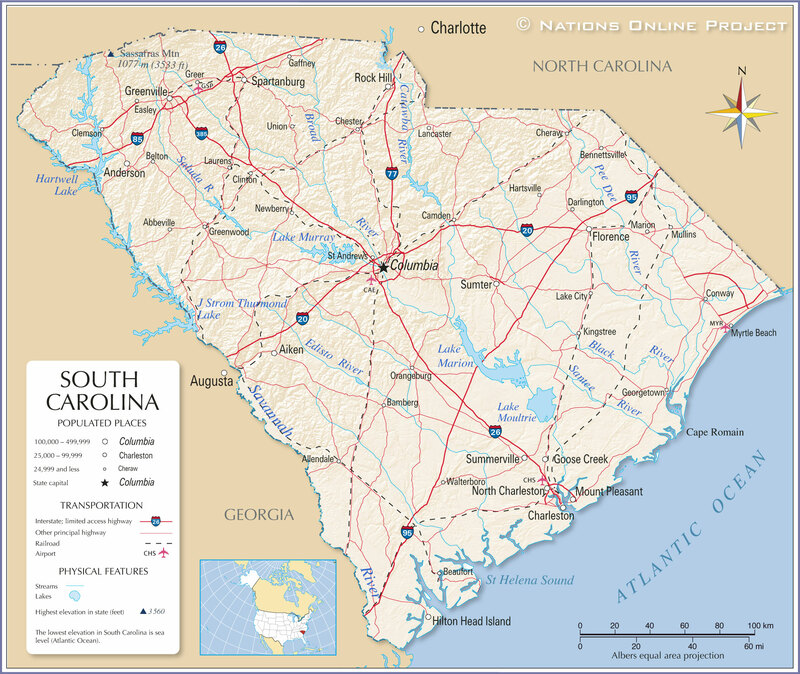 The detailed map is showing the US state of South Carolina with boundaries, the location of the state capital Columbia, major cities and populated places, rivers, streams and lakes, interstate highways, principal highways, and railroads.